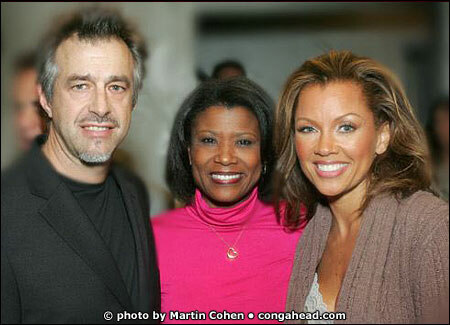 Thanks to percussionist Roger Squitero, I was able to attend the Vanessa Williams Christmas Show at the Palace Theater in New York City on December 2, 2004. Vanessa's band consisted of LP® artist Roger Squitero and at least 12 strings along with brass and two keyboard players. Roger is one of those guys who are comfortable performing in any situation and usually works with high-profile stars. His setup is extensive and LP percussion dominates his setup. He is a master of the shekere which he uses so tastefully in the show. I have known Roger for over 25 years. I first met him when he performed in my home studio in 1979 in the recording of a Brazilian tune for Alfredo de la Fé. Thanks to Roger, I was able to get these important photos.